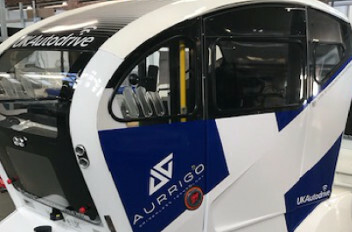 Delegates at CAV Scotland 2018 will be able to enjoy an autonomous driving experience in a colourful and distinctive AurriGo PodZero, designed to carry four people for journeys from transport hubs to and from a wide range of destinations. The electrically-powered pods operate using short and long-range LIDAR and cameras mounted front and rear, as well as inside. Visitors will also see in action a three-wheeled line marking robot introduced to the UK by leading road marking specialist WJ. Dubbed 'Roberta', the robot lays out pre-marks in advance of permanent markings. A recent project had the robot marking out a 5km hard shoulder line on both sides of the carriageway, completing the task – without risk to road workers – in five hours – a job that would normally take an engineer four shifts. These are two of the live demos to take place at the two-day event at the Royal Highland Centre in Edinburgh, alongside Traffex Road Expo Scotland, on 31 October and 1 November, bringing together experts and thought leaders in the field alongside the technology companies/demonstrators and associated organisations with an interest in CAVs (connected and autonomous vehicles). Speaking at the conference, Chris Jackson from law firm Burges Salmon, will discuss the legal implications of emerging transport technology. 'Connected and autonomous vehicles are rapidly becoming a technological, social and economic reality,' he said. Adrian Tatum, head of events for Transport Network, which is organising demonstrations and the conference programme said: There are still many unanswered questions around CAV development: preparing our roads for autonomous vehicles; insurance and legal issues; and public confidence.